The Bank of Canada has updated its framework for unconventional monetary policy, which has generated a lot of headlines given the discussion of negative interest rates. I would take the remarks of Governor Poloz at face value, that a move towards negative rates is not imminent (unless the next financial crisis is imminent, which I do not rule out). Although mildly negative rates might do something or other (in my view, it would be a net negative for growth), none of the possible steps outlined in the paper would be effective if the Canadian housing market follows the path of the American. Leo Kolivakis, an ex-colleague of mine, and publisher of the Pension Pulse blog, has a longer article discussing this topic. I want to be brief, and will only discuss the policy framework options here. The paper outlines possible policy options to work around the perceived lower bound of 0% interest rates. This supposed lower bound was the result of the fact that currency -- notes and coins -- pay 0% interest, and it would be possible to withdraw currency to avoid negative interest rates within the banking system. However, as the Europeans have proved, mildly negative interest rates would not be enough to trigger a widespread flight to cash (the Bank of Canada estimates -0.50% would not trigger a flight to currency, which is in the middle of my estimated range discussed here). Options discussed are listed below. Forward Guidance. Within New Keynesian models, the spot overnight rate does not matter for much, rather it is the expected path of rates. The believers in these models argue that policy makers can bloviate about the future path of interest rates, and this will magically levitate the economy. Needless to say, I am skeptical about those models, but one may note that bond yields are driven by rate expectations. Forward guidance is a way of trying to lower bond yields, which according to conventional thinking, will stimulate the economy. Unfortunately, bond investors have no reason to believe that long-term forecasts by the central bank are accurate, and so it is unclear whether forward guidance is any more effective than any other technique of "jawboning" the market. Meanwhile, the Bank of Canada has tried this before, and its debatable how well they followed their own guidance. For example, in the January 2010 Monetary Policy Report, the Bank re-iterated a commitment keep the rate unchanged "until the end of the second quarter of 2010," but they raised rates on June 1st, which was before the end of the quarter. Obviously, not a huge miss, but it still tells us that forward guidance and $1.75 will get you a cup of coffee (my earlier article had it as $1.60; inflation!). Mildly Negative Interest Rates. In my view, dropping rates to -0.50% would be a net negative for the economy. It will help induce an atmosphere of panic, and crush the very large cohort of people who are saving for retirement. The increased needs for saving may drown out any positive effects for growth created by lower interest rates. Large Scale Asset Purchases ("Quantitative Easing"). This is either the purchase of (Federal) Government of Canada of Canada bonds, or bonds issued by other entities. Purchases of Government of Canada bonds will do exactly nothing. 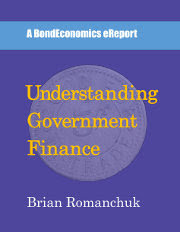 (I discuss this in Section 5.4 of my eReport, Understanding Government Finance.) Purchases of other issuer's securities is a loan from the Federal Government to another entity, and would do about as much as any other government lending programme (as discussed next). Funding for Credit. Participation in programmes where the Bank of Canada supports lending to some sector of the economy. For example, the Bank could buy car loans from banks, with the car loans meeting some particular criteria. This would presumably help out car dealers and manufacturers. Although such programmes could be useful in some countries, I have my doubts how they would work in Canada. Canada is dominated by a handful of large banks; if they are seen as creditworthy, the financial system will be able to function normally (as seen in Canada's rapid bounce back from the financial crisis). In this case, such programmes would not be needed. However, if the big banks are impaired, these programmes would be dwarfed by the problems faced by the Canadian financial system and the economy. Any return to normality would require putting the banking system back on a sound footing (requiring either regulatory forbearance, capital injection, or a debt workout). In summary, if the Canadian economy implodes, monetary policy will not be in a position to do anything useful about it. "The increased needs for saving may drown out any positive effects for growth created by lower interest rates." Not sure how it would lower interest rates. The evidence from other countries where they have tried this ploy is that the commercial banks do what any sensible bank would do in this situation and put the negative interest charge on the price of loans rather than try and steal it from depositors. The whole notion is still based upon the idea that banks need funds to lend, rather than lending creating a pool of funds which banks then fight over to lower their cost of funding. I am assuming that this would drive down bond yields, which would feed through to mortgage rates. (In Canada, the 5-year point is the benchmark for mortgages; even if you have a floating rate mortgage, you have to qualify based on the 5-year interest rate.) So at least some important private sector yields would be lower, even if banks try to work around this in their loan and deposit pricing. I think it's safe to assume that if we ever reach the point of negative rates, it won't be a good sign for the economy. Banks will likely pass any costs they incur off to their clients which will prolong the pain of debt deflation. The one thing that worries me is what do negative rates mean for housing. Governor Poloz addressed this briefly in the Q&A but if negative rates entice Canadians to take on more loans to buy overvalued houses, the fallout will be vicious and the downturn will persist for years. I did not have time to look at the article, but they only need negative rates of the housing market has already imploded. If housing is fine, they can leave rates where they are. The drop in the value of CAD is doing more for the real economy than lower rates ever could.